From the submitter: “The head is an octopus from Origami Omnibus Creative Origami (corrected 2008.01.09) by Kunihiko Kasahara. The body is a dragon from Origami to Astonish and Amuse, by Jeremy Shafer.” Way awesome. This is amazingly great…not to mention creative! Thanks! That’s super special awesome. You really like the whole non-euclidean joke don’t you Xolotl? I suppose it is one of my favorite themes, though. 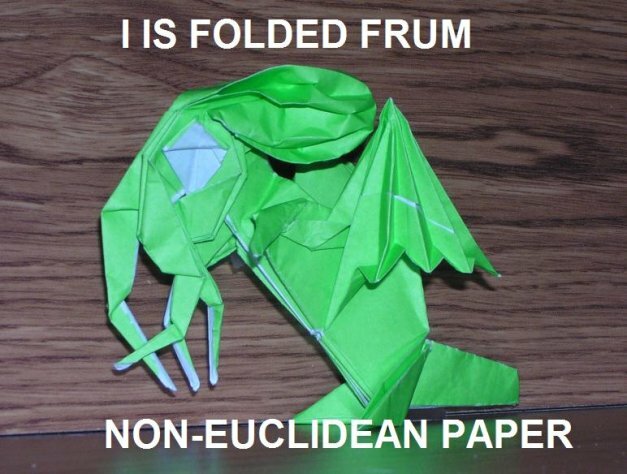 So, I guess you’re not using A4 paper to fold that thing? ‘All at once the question became academic- a situation the old man dreaded, since he was not an academic type. With a squeal of splintering wood, the roof lifted from the walls, wrenched up and back by a immense fog-wreathed reptilian-looking claw. The old man bolted for the front door. A second claw reached down and lifted him high into the misty gloom. Two bilious green lights became visible in the fog above him. As he rose higher and higher, he realized that they were terrible eyes, located in the midst of a huge octopuslike head fringed with dangling, writing tentacles. By what power those orbs had picked him out of the fog, he had no idea. But he knew he was dealing with something far beyond his ken, something unguessably eldritch and cacodaemonical and non-Euclidean. “So, you think I’m non-Euclidean, huh?” the monstrosity boomed. “Well, sir…” the storekeeper squeaked. Slight mistake, the octopus head is Creative Origami by Kunihiko Kasahara. Wrong book, same author. I have too many books.